Take the number 55 offramp off the N1 onto Main Road – Paarl. Turn left into Main Road. Stay on Main Road for approximately 4km, passing several robots and crossings until McDonald’s can be seen on the left. Directly opposite McDonalds, Pastorie Avenue turns off to the right. 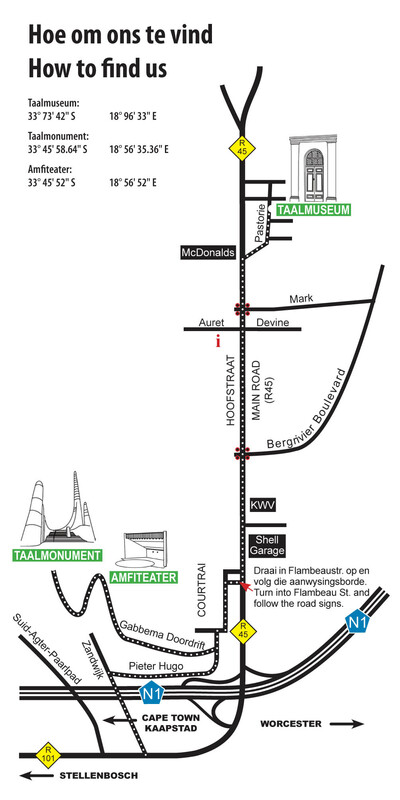 Follow Pastorie Avenue for approximately 200m, where you will see the Taalmuseum on your right. The Historium Conference Centre is the building to the left of the Taalmuseum.